Stephen DonCarlos, mayor of Baytown but also representing the Houston Port Authority, present a plan to Council that shows new sidewalks the Port will build, from Galena Park to Jacinto City. 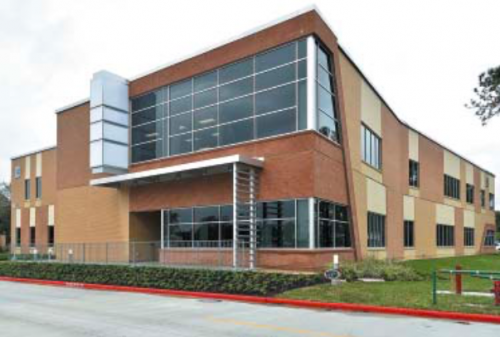 GALENA PARK – The business of the city moved ahead at two City Council meetings last week. A large agenda was heard and acted on with efficiency and cooperation between the Mayor and the new Council on June 7, and then on June 9 at a special called meeting Council took action on replacing the Police Chief. In her first term, in 2014, Mayor Moya had attempted to replace the city administrator, police chief, city attorney, and some department heads. Unsuccessful then, she achieved all of those changes in her second term, this year, with the support of a totally new Council. At the June 9 meeting, Police Chief Jonathan Rader was demoted to Sergeant, and an interim Police Chief, Sgt. Andrew Scroggins was appointed. Moya also announced that she had assumed the managerial duties of running the city, since the City Administrator position had been eliminated. Improvements in the city were announced in several presentation. Stephen DonCarlos, mayor of Baytown and board member of the Port of Houston Authority, presented a plan to Council that will build new sidewalks and walkway lighting along Mercury Drive and Holland Avenue. The Port has offered to pay most of the cost, asking for a small contribution from the city. The project will be built in phases, with one street receiving a sidewalk, and the other later. When complete, a walking/jogging/biking trail completely surrounding the Port’s property will exist, DonCarlos said. Linda Jamail, Nominee Hillary Clinton and Allan Jamail. 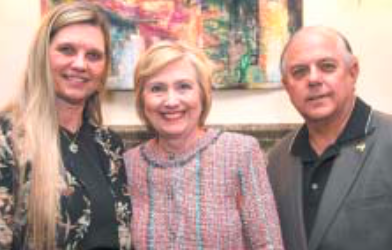 Recently Linda and Allan Jamail visited with Democratic Party Presidential Nominee Hillary Clinton during her Houston visit. The Jamails, both Texas Democratic Party Executive Committee members, were part of a small private gathering of Clinton supporters committed to the historical presidential candidacy of Hillary as the first female presidential candidate of a major political party in the United States. Hillary pledged to raise wages for the lowest-paid jobs and strengthen equal pay protections for women. She knocked Trump who opposes the Paycheck Fairness Act over fears that it could make it easier to sue corporations over allegations of pay inequity. The new library has 42,718-square-feet which also includes a law library and other departments, areas. HOUSTON — Civic leaders, community residents and San Jacinto College employees were on hand on Wednesday, June 8 for the grand reopening of the Lehr Library, located at the west entrance of the San Jacinto College North Campus on Uvalde Road. The 42,718-square-feet facility includes a traditional library as well as a law library, a media department and the North Campus Student Success Center. The library also includes an outdoor learning area where classes or special events can be held. The open-air arena has two tiers of seating and is surrounded by attractive landscaping. Lyn Garner, North Campus library director, welcomed guests to the ceremony and invited them to tour the facility. The new Lehr Library building replaces the original Lehr Library, which will be demolished to make way for new construction.